Durable: With woven labels, your logo, name or business name isn’t stamped onto the label; it is literally woven in with thread. This means the label won’t chip or peel off, won’t fade prematurely, and will be readable and intact for as long as the label is. These labels are very durable and are relatively inexpensive, making them an economical choice. Personal Touch: Woven labels are classic, and have a hand-made, personal feel to them. This makes them perfect for hand knitted or sewn garments or boutique clothing that you want to make feel personal. 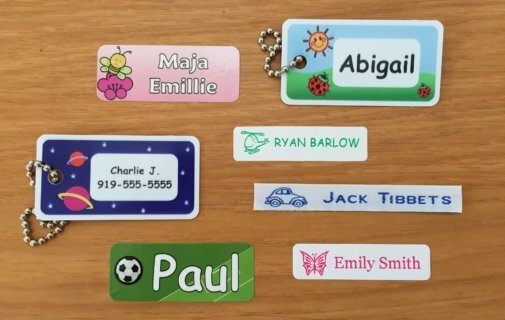 Variety: These labels can be sewing labels or iron-in labels, and are available in a range of colors, both on the background and the thread that is woven in to form your logo. They come in many sizes, textures, levels of finesse, and more. If you are looking for a label that gives you flexibility when you are designing, this is the perfect choice. It’s hard to go wrong with a custom woven label, so start designing yours today, or call 1-866-695-2235 to speak to a labeling expert for help designing your labels.